Read it now... just click on the link above or the image below. Take notes while you read it! 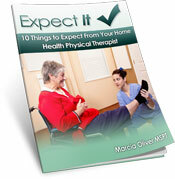 It will help you be a wise consumer of home health physical therapy now or in the future! Check your email in a couple days - we're going to send you a 50% discount code for Home Health Lemons: How Home Health Physical Therapy Pay Could Affect Your Care! It's super insightful and will get you thinking about questions to ask before you hire a home health agency - that is your right, you know.